The Montana Senate has approved a bill that would exempt the state from DST after this year, and the bill has now moved over to the House, with a hearing scheduled later this week. 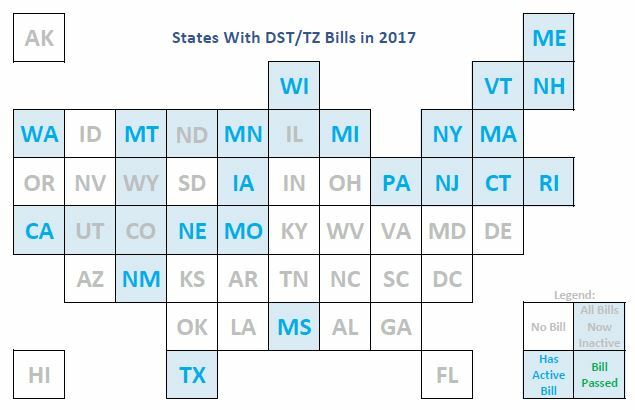 If the bill passes, Montana would join Arizona and Hawaii in not Springing Forward in March and Falling Back in November. I live in Wyoming. How do I get this same result in Wyoming?? You have to get your state legislature to pass it. Check your state’s legislative info page, find out who your Senator and Representatives are, write to them and tell them how you feel. 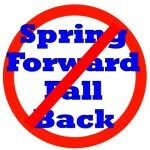 So has the NM bill for year-round DST. http://krwg.org/post/bill-would-keep-new-mexico-daylight-saving-time-all-year. NM bill is illegal as hell. This is the worst idea ever! Most people who work 8-5 would like to get out and enjoy the daylight in the summer!! Summers are short enough as it is in Montana ! Please reconsider passing this bill! The sun would not set until after 7 in the summer in Montana if it stayed on standard time. It’s far enough west and north to where it gets more sunlight in the summer than any states except Alaska and Washington, plus the Idaho panhandle. I say since is DST time now leave it like this and say no to fall back in Nov.
Do we all want to drive home in the dark at 5pm in August ? What about the fall sports like XC, softball and football in the evenings that start in Sept? Soccer games and some football games may be played around 10 am -4 pm on Saturday . Plus, Montana is a farming place as the growing of the plants with the night sun helps the growth better . Most of the crops r ready to harvest by October if we stick with full time standard time we may have to be buying produce from other farmers. Plus no more Alive after 5 Thurs Partying, the farmer markets may end because not enough of produce . No More Movies in the Park @ 6pm in the Summer , No More Nite Concerts in the park . As they say after work you play so don’t people usually head to work around 7 am and work til 5 or 6pm ? So do we want to go to work wishing we could enjoy the outside sunshine then by the time we get off of work it would be too dark to enjoy it ? That’s what would happen if we stayed at standard time. Plus, Arizona is actually supposed to be at PST but when they were at PDT and decided not to fall back they became at the MST zone . TK, year-round daylight savings time is illegal. It is legal to exempt a state from DST, but not to go the other way. Do a little research before you brag about how great DST is, which it really is not. The New Mexico bill is a violation of federal law. If Martinez does not veto it, then she’s completely clueless.